Included in this set are two Innova disc golf discs which both will float on water if you happen to throw an errant shot into the lake! This can really help you get the disc back, as sometimes you can't see a disc after it sinks. Both are made with the super-grippy Innova R-Pro plastic, which makes them great for courses with a lot of water or for rainy days, as they maintain their grip when wet. Innova says about the Wahoo driver: 'The Wahoo is a fast disc with a lot of glide. This disc has a flight similar to a Dragon with increased speed and range. The Wahoo is a floating distance driver that will give you the confidence to throw over larger bodies of water than ever before." 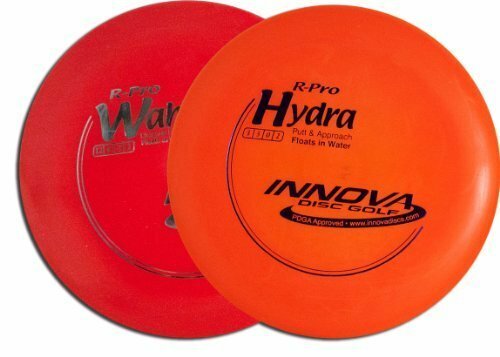 ..and about the Hydra: "The Hydra is a Putt & Approach disc for short turning drives and approach shots. It is made with a grippy, durable plastic that floats in water. It is easy to release and has a friendly grip making it great putter as well. All Hydras are approximately 175 grams." If you have any questions about this product by Innova - Champion Discs, contact us by completing and submitting the form below. If you are looking for a specif part number, please include it with your message.